Meet your personal epicurean concierge (aka guide) along the curb of the Embarcadero in front of the Ferry Building's main entrance. 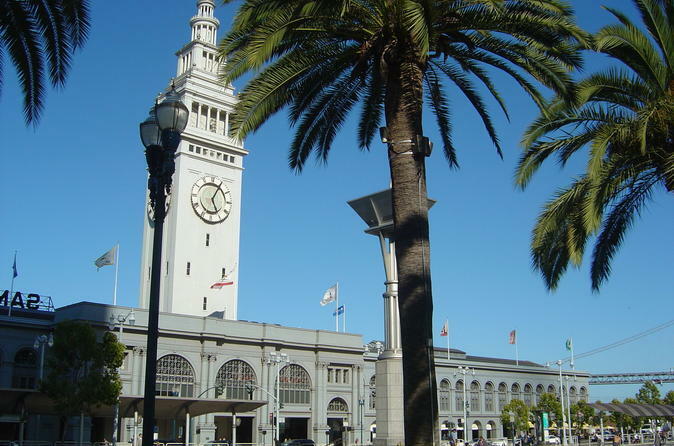 It's a San Francisco landmark with its iconic 245-foot (75-m) clock tower. Built in the late 1800s, the ferry terminal was renovated in 2003, transforming the concourse into the foodie haven that it is today. Local food purveyors and artisans peddle their wares inside and outside the building — one-stop shopping for anyone looking to experience a taste of San Francisco. Learn more about the San Francisco Bay Area's tastemakers as you nibble on Cowgirl Creamery's award-winning cheese, Acme Bread's fresh loaves, and Miette Patisserie's delicate French macarons. Want more? Indulge in a cup of chili from the American Eatery and satisfy your sweet tooth with handmade chocolates from Recchiuti. If you’re visiting during one of the weekly farmers’ markets, don’t be surprised if your guide points out some of the city’s revered chefs shopping for fresh produce to include on their menus. After you satiate your appetite on the food tour, you'll receive directions to Pier 33 to pick up your Alcatraz tickets for the next portion of your tour. Take a stroll along the Embarcadero to Pier 33 where you'll hop on the ferry for a scenic ride to Alcatraz. Explore the island at your leisure with the award-winning Cellhouse audio walking tour to discover hidden secrets and fascinating stories of the world’s most notorious prison. Ferries depart the island frequently to provide maximum flexibility for your time on Alcatraz.